Alexievich won the Nobel Prize for her oral histories of Russia and the Soviet Union. Secondhand Time includes exquisitely curated accounts of members of the Former Soviet Union beginning with old-timers that can still recall Stalin. She speaks with citizens still longing for the stability Stalin’s rule ensured and intermingles enough survivors of the gulag to make clear that nothing was worth the bloodshed and destruction that accompanied Stalin’s tyranny. She continues with accounts from the post-Stalin era through the Yeltsin restoration of order and Gorbachev’s opening to capitalism. Her interviewees make abundantly clear that replacing the communist ideal of equality for all with the frenzied shark attacks of capitalism has not been a smooth nor beneficial transition. The oligarchs have profited beyond anyone’s wildest needs and the needy have been left to struggle to survive. Young people that have never known anything but capitalism, according to their elders, worship materialism over community and mutual support. 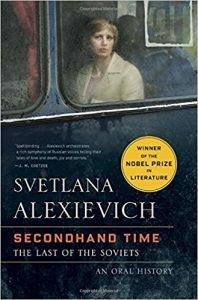 Like many Russian pieces of literature, Secondhand Time is extensive and thorough, almost as if you were in kitchen after kitchen drinking Russian tea and then vodka deep into the night. The final picture is masterful, with one caveat. Alexievich never really describes her methods and there is some evidence that she has moved quotations from one speaker to another in different publications suggesting some of her books might be as much fiction as non-fiction. That changes how you read her, I’m afraid. 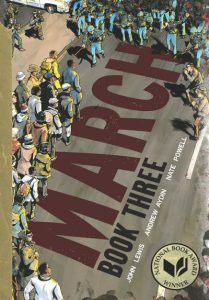 This is the final installment of the biography of Congressman John Lewis’s youthful campaign for civil rights for America’s black population. Books One and Two cover the fight for desegregation in the later 1950s and early 1960s. Book Three details what it took to force President Johnson to introduce legislation allowing the federal government of the United States to override southern states that forbid blacks from voting. For years John Lewis led the Southern Nonviolent Coordinating Committee through peaceful demonstrations to enable Americans with dark skin to register to vote like other Americans. Repeatedly, men and women approaching courthouses hoping to register were met with police beatings, enabled posses of armed white men, obstinate white judges, and murderous Klansmen. The story is a bloody one and sprinkled throughout are references to an event that was unimaginable in 1964: John Lewis, the Congressman, attending the inauguration of Barack Obama. And yet, today, gerrymandering of voting districts mean that Republicans (with negligible support or accountability to black voters) control the Presidency (who did not win the popular vote), both houses of Congress, the Supreme Court, and a majority of governorships and statehouses. Everyone should read this book. And consider kneeling during the National Anthem. An Irish murder squad is called upon to investigate the cult-like death of a child in the village of Knocknaree. Bob Ryan and Cassie Maddox are the lead detectives and we, the readers, are taken to grapple with mysteries on several levels. The obvious question is whodunnit to the kid found atop an alter stone in the middle of an archaeological dig, but there are deeper layers. Bob Ryan was once a child himself in Knocknaree and the only survivor when two of his friends disappeared. That case was never solved and Ryan has no memory of the event during which his childhood mates were presumably murdered. 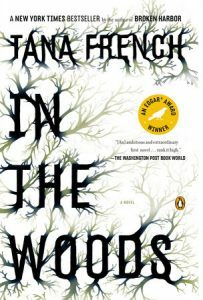 Can Ryan investigate a murder and his own childhood, especially if the two cases are linked, without losing his sanity? Ryan and Maddox are best friends, so close they behave like long-term lovers, raising another mystery of why they are not. Uncovering the perpetrator is standard fare: difficult to figure out with suitable suspects and red herrings. Revealing the psyches of contemporary Dubliners is what moves the story from page to page. The year is 1870. Captain Jefferson Kyle Kidd, veteran of three wars, now age 72, is more or less handed a ten-year-old girl to return to her German family in south Texas. The girl was kidnapped by Kiowa Indians at the age of six and has been recaptured by bounty hunters. Her parents are dead and Captain Kidd is now responsible for returning the girl, who no longer speaks English nor German, to her nearest relatives. Everything about their adventure as the old man and his young companion ride a horse drawn wagon across unsettled Texas landscapes feels authentic. 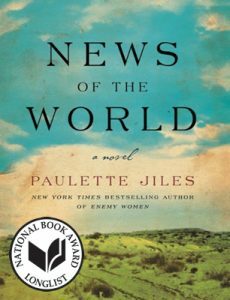 Whereas a less skilled novelist might vacillate between plot, character, and showing off research, Paulette Jiles simply puts us in the driver’s seat. The Texas hills and deserts roll by in perfect clarity. Storms rage over head, the sun beats down, and sometimes it just drizzles for days. Strangers — some friendly, a few weird, and a couple who are downright dangerous — ride up alongside and we face them with whatever skills we have at our disposal. Moreover, the groups who cohabit south Texas are raised beyond typecasting. Kiowa, Spanish, soldiers, women, homesteaders, and settlers are presented as you might expect real people to be. They are complicated. You like some and dislike others. It is a deeply informative and thoughtful ride. Almost from the day he was born into privilege, Winston Churchill was ambitious. 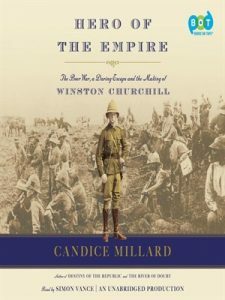 Searching for an opportunity to demonstrate his talents and value to the wider British empire, Churchill enlisted in Great Britain’s army in India, ran for parliament (and lost), and finally, still in his early twenties, shipped off to South Africa as a journalist to cover the Boer War. The Boer War was fought between two colonial powers, the white descendants of Dutch settlers and the British with obvious disregard and disrespect for the continent’s natives. During a skirmish when an English train of soldiers was ambushed by Boer fighters, Churchill-the-embedded-reporter, demonstrated extraordinary leadership and selfless heroism before being captured. Then, despite overwhelming odds, he managed a solo escape from a military prison across enemy territory and many hundreds of miles of African desert to earn his freedom. Immediately he enlisted in the army and continued to fight for England. The traits on display in his younger years reappear some three decades later when Churchill’s self-assurance and stubborn belief in the ability of England to fend off an enemy would make him the hero that stood up to Hitler’s Germany. And yet in this post-Obama era of Trump, even an historical account of excessive self-confidence scratches up against the border of narcissism that is so intolerable in a nation’s leader. Three parallel stories expertly told. In the first, the author trains a goshawk to fly from her glove to hunt pheasants and rabbits on the British countryside. In a second, Macdonald recounts the life of T.H. White, author of Arthurian novels, depressed, gay, abused, and also a goshawk trainer. 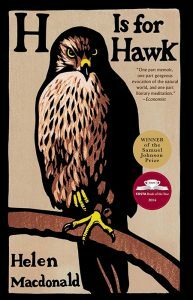 And, in the third, she writes a memoir of the year that her father died unexpectedly, she acquired a hawk, named it Mabel, trained Mabel, lost her happiness, read everything of T.H. White’s, scrambled in the British woods behind her not always cooperative goshawk, and muddled through. We learn to see Britain’s hedges and forests through the eyes of an expert hawker and the eyes of a hawk, and Britain’s mid-twentieth century rigidity through the writings of T.H. White. 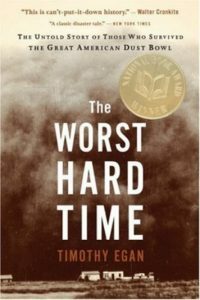 This recounting of America’s dust bowl is a vivid, filthy painting of an American environmental disaster brought about by greed, hubris, and ignorance. After demolishing the Comanche and the bison, an American government anxious to “settle” the West gave away its prairie in huge chunks. Plows sliced prairie grasses from their deep roots creating caskets of bare soil over buried sod. Homesteader wheat, mining untapped soil nutrients and decomposing grasses, produce unimaginably profitable and prolific yields. When the Great Depression struck in 1929, jobless masses in East Coast cities could not afford to pay for food and wheat piled up in the Great Plains. In terrible need of income farmers expanded production, exacerbating the problem. Then one of the periodic droughts that has always cycled through the Great Plains struck the year following the crash of the stock market and stretched nearly a decade. Crops died. Then trees and streams, horses and cattle all withered. Great roiling winds picked up tons and tons of soil hurling black blizzards of sand and grit across the plains and finally people, their lungs so full of dust they could not draw sufficient oxygen, they, too, started to die and with them the farms and towns of Texas, Oklahoma, Colorado, and Kansas that should never have exchanged perennial grasses, bison, antelope, snakes, and hares for wheat, corn, and cotton. The soil of the Great Plains was eventually tied down by the Soil Conservation Service and new plants grown on water mined from the Ogallala Aquifer, which shortly will run dry. It is the middle of the fifth century, though you would have to know that on your own, as there is no indication in the book, and the Roman Empire is coming to an end. For Rome the benefit of maintaining its long-term occupation of Great Britain is no longer worth the cost and it withdraws its forces. Aquila, an 18-year-old Roman soldier, having lived his entire life in Britain deserts the Roman army only to be instantly subdued by the first invasion of Saxons. In this book, Saxons are brutish vikings, and despite the fact they are to become the forebears of the Anglo-Saxons of Great Britain, they are described as not much more than seafaring guerillas. 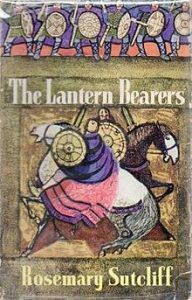 Written ostensibly as a children’s book in 1959, and winner of many awards, now more than half a century later, The Lantern Bearers can be difficult to penetrate. It presumes mastery of mid-century British language interspersed with working knowledge of early British history. 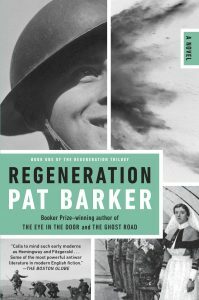 As historical fiction runs, this one is not all bad, but by today’s standards the characters are thin and the plot more than a little contrived. In so many ways Tree of Smoke is easier to describe for what it really is not. The setting is Vietnam, and to a lesser extent the Philippines, in the 1960s, but it is not a war novel. The protagonist, Skip Sands, works for the CIA, but neither is Tree of Smoke a spy story. 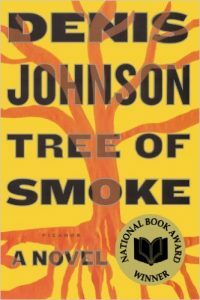 Rather Johnson’s award winning novel is a detailed chronicle of a number of lives over the course of the 1960s told with page-turning drive and riveting attention to detail. Every baguette served in Saigon tastes a little different from the last. The temperature of the tea is hot on your tongue. The swampy humidity makes your clothes stick to you and each character’s choices in life seem preordained. A pair of down-and-out brothers from Arizona go off to fight in Vietnam and after being discharged continue to fight enemies within and without. A Canadian missionary heals orphans when no one else will because her bible leaves her no alternative. The Colonel is larger than life and for a time bigger than the army until he isn’t. . Uncertainty, like much of life, pervades. America’s role in Southeast Asia is a perfect metaphor.